During the last two weeks before the Christmas break, we had the opportunity to experience the creativity and imagination of year 7 students as they took part in ‘Dragons’ Den at Christmas’. 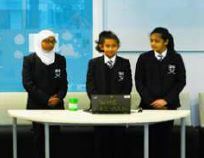 We were astounded by the level of enterprise on show, as well as the enthusiasm, organisation and teamwork which students displayed throughout the competition. 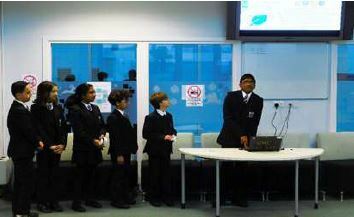 The competition required teams to create an eco-friendly juice drink that was commercially viable. The ideas we received exceeded all our expectations. We congratulate all the Year 7 forms and their tutors. They showed high amounts of energy and hard work as well as strong planning and organisation skills, but in the end we had to pick 6 teams (Fruitalicios (7AFH), Bursting Bubbles (7JAD), Keapple (7HYA), Break Fresh (7JAD), Chameleon (7JAD), Fruitea (7SZJ)) to go through to the final and face the daunting challenge of some tough questioning from the Dragons. But there can only be one winner and that was ‘Fruitalicios’. WELL DONE. We were part of the team of Dragons who acted as the judges and we can honestly say that we were impressed by all the finalists. They showed great confidence in the face of some difficult challenges. It highlighted, what we already knew, that there is a tremendous pool of talent that exists in the younger year groups of Whitmore High school. Once again, a big thank you to all the tutors and students who helped make this such an enjoyable and fun experience during the festive season.